Abstract. The establishment of plant species can limit soil erosion dynamics in degraded lands. In marly areas in the Southern French Alps, both harsh water erosion and drought conditions in summer due to the Mediterranean mountainous climate prevent the natural implementation and regeneration of vegetation. Soil fertility improvement is sometimes necessary. With the purpose of revegetating such areas, we aimed to evaluate the effects of wood chip amendments on the revegetation performance of different native or sub-spontaneous plant species. We conducted two experiments on steep slopes over three growing seasons (2012–2014). The first consisted of planting seedlings (10 species), and the second consisted of seeding (nine species including six used in the first experiment). First we noted that wood chips were able to remain in place even in steep slope conditions. The planting of seedlings showed both an impact of wood chip amendment and differences between species. A positive effect of wood chips was shown with overall improvement of plant survival (increasing by 11% on average, by up to 50% for some species). In the seeding experiment, no plants survived after three growing seasons. 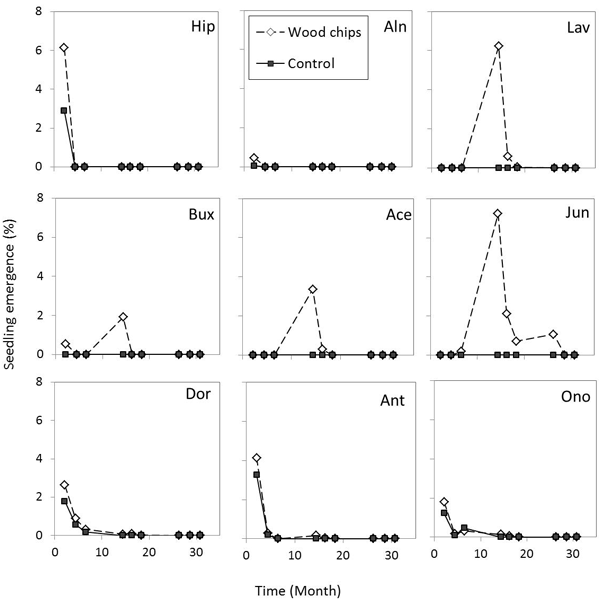 However, intermediate results for the first and second years showed a positive effect of wood chips on seedling emergence: seeds of four species only sprouted on wood chips, and for the five other species the average emergence rate increased by 50%. 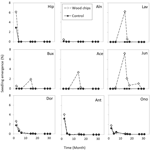 How to cite: Breton, V., Crosaz, Y., and Rey, F.: Effects of wood chip amendments on the revegetation performance of plant species on eroded marly terrains in a Mediterranean mountainous climate (Southern Alps, France), Solid Earth, 7, 599-610, https://doi.org/10.5194/se-7-599-2016, 2016.